Congratulations to Latisha D. for winning the Dell Netbook from Sam's Club! To keep ringing in that holiday cheer, we're giving away a Dell Inspiron 10" Mini 1012 netbook ($280) and a Mundi leather laptop rolling tote bag ($150) courtesy of Sam's Club. The 10" Dell Inspiron Mini is a great travel companion, and also is a perfect primary computer for kids or for those that want light computing capabilities in a compact package. And if you're still looking for gifts, check out all of the Holiday Specials and Electronics from Sam's Club. Sign-up for our FREE Techlicious Newsletter—be sure to provide a valid email address when you sign-up (the same one used for your comment) so we can contact you if you win. Once you have subscribed, tell us in a comment below "What will you do with the Dell netbook if you win?" Want an extra chance to win? Become a Fan of the Techlicious Facebook Page. Just "Like" us in the Facebook box and the post a second comment below for your Facebook entry (Yes, we know it's a little bit of a pain to post twice, but we need to track your entries!). Don't post your entry on the Facebok page, we can't accept entries there. We will randomly select one (1) winner from the entries. No purchase is necessary to win. The giveaway will end at 11:59pm on December 19th, 2010. Void where prohibited. U.S. residents only. Click here for the full rules. What will I do with the Dell netbook if I win? I will strictly use this for my classes in college. Right now is my freshmen year at my local community college, I was waiting for FAFSA to get back to me on my application of Financial aid. I just got it recently and im already in debt because my family lost the house, so im paying for housing, books, and tuition. I’m currently taking so many classes I can barely find a way to pay rent. So if I won this netbook, it would be my first laptop, it will be totally convenient for writing notes in class, reports, PDF’s for research, Presentations, and other school related stuff. I wouldn’t have to lug 6 notebooks, 4 books, and extra and various supplies around everyday. I could write all the notes with this, scan the books, or trade them in and buy ebook versions, and never need anything but this and a lined notebook and a pencil. Thank you so much for this opportunity, I just hope it works out, as its my only chance at a PC. Oh yeah, here is the LIKE on facebook. Thanks again. Take care everyone, and happy holidays. What would I do with a Dell if I win??? I would share it with my 4-year-old daughter. She is completely into computers!!! If i won my boyfriend would use it for his band. I would use this for myself. I am constantly asking my husband to use his when we are on the go. Follow as @dave01568 on twitter. if i won then my grandkids would have one for school, and i would be able to go back to school. If I won I would give this to my daughter who has no computer because with the two kids and todays economy she and hubby have no money for extras like this! She would love it! Fan of the Techlicious Facebook Page-carol yerby lewis. I will give the Dell netbook to my oldest daughter if I win. I’m a Fan of the Techlicious Facebook Page (Deanna Devendorf McClellan). If I did win would use it to work with my 5 year old grandson. He is severe AdHd , diagnosed since 2 yrs. of age. It is very hard to keep him focused I believe it would help keep his attention and become a learning tool for him. Thanks for the chance. If i win, I have a daughter who could use this for her college classes. I “like” you on FB as Johncee Darrow. I will use it to work, read and watch movies at bedtime, and will give to my 3 year old to play. If I win, I will use it to write in bed! I will give the netbook to my husband for Christmas. His notebook is about to pass into the nether-regions of tech and this would be a great surprise for him! i will use this to give to my daughter as a gift for her to use at college. I would use this to surf the web. I am a fan/like Techlicious on Facebook! I waould like the Dell to help me keep in touch with my family when I travel. I am an email subscriber and i will use this netbook to follow your blog! I would give it to my son, who is a senior this year. He will need one for college! My husband is a free lance writer and could really use this computer! I would gift this to him so he could focus more on his writing and be able to take day trips with it! I like you on Facebook as Lisa Pederson. I would use the Dell Netbook for school mainly. I would also use it for my browsing my favorite sites. Iwould take it with me and use it all of the time. If I won I would reclaim my own laptop and finally give my husband his own. Well, he may have to share with one kid and I could share with the other. 1 computer in a tech savy house and kids with all their school projects and educational sites just doesn’t workout! Keeping with the times is expensive! I “Like” on FB: Tonya C.
I like you on Facebook. And Dell notebook will be awesome for me. My son has been asking for this Dell for a long, long time! He needs it for college and I would give it to him! The kids have taken over all the other computers in the house. Daddy needs a new computer - of his own. I would take it to the hospital with me to use while I’m going to be waiting there a loooonnnngggg time for a test I’ll be being watched during. If I won I would definitely utilize this Dell laptop for grad school. Thanks so much for the entry! I would use my new Del at work. I work all day long on my laptop and need a new one!! I am an email subscriber! If I won the netbook, I would give it to my son, who is a senior in high school and could really use a computer. Thanks for the chance! 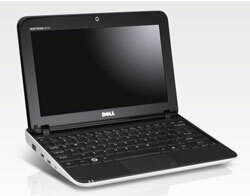 If I won the Dell Netbook, I would mainly use it to keep up with my email when I travel and light web surfing. If I won, I would use this as my main computer. We have a older desktop right now, but now that our kids are getting older, they tend to use the computer for doing their homework and I seldom get to go on it when they’re home. I’m an email subscriber and if I won this, it would be going to my son. He is having to use my computer a lot more to do school work. This would be help in writing those papers and doing research for him.